Recently, upon the suggestion of a colleague (who is also a mobility researcher), our departmental board accepted the idea of low carbon transport for conference travel. Since, low carbon conference travel, mainly translated into travelling by trains rather than flights, is often more expensive, our department agreed to bear the additional costs or accept higher costs of travel. Personally, I think it is a great idea and decided to quickly get on board. Although, I think the number of critical debates I had with colleagues on this issue, some might think that I am a low carbon travel sceptic. I actually love the idea and I will say more about this in the end. Anyway, a couple of weeks ago I travelled by trains on from Eindhoven to Edinburgh and back again, and thought it might be interesting to share the experience and some tips. So, here we go. It is important to keep enough time for changing trains. They get delayed. I had to change trains 3 time while going to Edinburgh (Breda, Brussels and London) and 4 (London, Brussels, Antwerp and Breda) times while coming back. I get stressed when it comes to transportation. So I always try to keep enough time for major changes like in Brussels and London where I needed to go through emigration to get into the Eurostar. Eurostar recommends 1 hour but as I am a non-EU citizen, I prefer to have more time for the infinite number of questions that the British border police likes to ask. Do not get me wrong, I enjoy the chitchat. But it takes time. Also, my trains from Breda to Brussels, from Brussels to London and Brussels to Antwerp were delayed. In Antwerp, I had to make a run for it. In my specific case, bookings needed to be done through separate agencies. At the moment, there is no website or app that can book train travels from Eindhoven to Edinburgh. The Dutch national rail website (NS) can do bookings up to London but gives only 50 min for change in Brussels. I could not find an option to say that I need a longer change time. So I booked the trains between Eindhoven and Brussels through NS, between Brussels and London through Eurostar and between London and Edinburgh through East Midlands trains. This, after spending much time looking for ways to do this in a simpler and more straightforward manner. You are likely to spend workdays travelling on trains. Plan to work on the move. 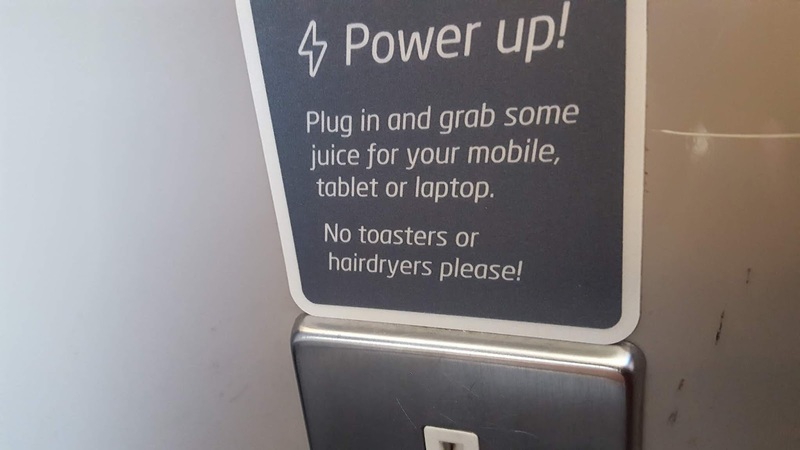 Remember to book trains and seats with power sockets. Dutch trains generally do not have power sockets. Eurostar has power sockets at some seats and many British trains have power sockets at some seats. Exercise your preference while booking. In addition, you might want to sit in the silent coach. But if you are travelling during rush hours, any coach is unlikely to be silent. Many trains have internet but often this is limited to first class coaches. If your workplace pays for it then you might want to use the facility to stay connected to work. Alternatively, possibly your workplace may agree to pay for data costs on your phone so you could stay connected. There are some important things you should remember to take along. Power packs and socket converter if, like me, you will travel on trains in an incompatible country. Remember to fully charge your devices before you head out. Sometime sockets on trains may not work or might be inaccessible because someone’s foot or luggage is on the way. Download some podcasts and TV shows because this is going to be a long journey and you will not be working all the time. Take a book, or a few. Most importantly take plenty of water and food. It is going to be a long a slow journey and you will need these. 1. Will people be able to claim childcare? They may have to spend more on childcare now that they might spend extra time travelling. Lack of compensation for such extra expenses might further deter many parents, especially women (as is already the case with conference travelling) from taking the low carbon conference travel option. 2. Will the extra time spent on travelling (2 days in my particular case) be considered as work or as holiday? As I understand it, these will be work hours. In that case, will extra expenses like booking first class to get internet access or getting mobile internet devices will be included in the budget. These will facilitate work. 3. Can we build more and better facilities for remote conference participation at the departmental level so many people might not need to travel at all. However, after the journey, another important element came to my mind. How did air travel become so popular and how do we get back to train travels (low carbon transport)? The main reason for the popularity of air travel is efficiency – shrinking space-time, being able to do many things and be at many places in a short span of time. In other words, doing more in less time; being efficient. I love train travel. Two years ago, I spent 10 days travelling by train from Eindhoven to Munich, Ljubljana, Budapest, Bratislava, Prague and Nuremberg. Last year, I spent 1 month traveling by trains from St Petersburg to Beijing and then across China. The charm – time slows down. One does less in a longer time. It is relaxing. This is why I love the idea of low carbon travel. However, train travel to and back from Edinburgh, when you are working or have to work at the same time, gets stressful. The long journey is exhausting. During the conference days, my 12-hour journey to Edinburgh affected me. After the conference, I was returning on a workday after 3 days of intense conferencing and before that a 12-hour train journey. It was a workday and I decided to work on the train. However, I could not focus and was very inefficient. I arrived in Eindhoven at 8pm and was back to work next day at 8.30am. At mid-day, I felt very tiered and lay down on my office floor to catch a nap. How do we counter this? I am pro low carbon travel. However, low carbon also means slower travel, loss of time and efficiency. I am happy to do this. However, my work demands me to be as efficient as before, to make maximum use of my time. It still wants more in a shorter period. For a transition to low carbon travel, we will also need to want less in a longer time; to not only slow down travel but also to slow down generally, at least around the travel times. To have a few extra days, to recover, paid. To expect less. This goes against our dominant economic system, which wants us to make changes, but not at the expense of efficiency. How do we tackle that? May be eventually we will again get used to the physical exhaustion of long train travels and eventually, there will be no compromise of efficiency. Lastly, I will continue to take low carbon options as much as I can, but hopefully at the same time continue the political conversations around this. Hopefully, a wider systemic change will come around.